Here's a selection of what TTDPatch 2.0 has to offer. For the full feature list, I'm afraid that you'll have to read the manual! You can use the up arrows to get back to the top of this page, and clicking on the headings takes you to the manual page that explains the feature in more detail. TTDPatch now supports new vehicles of all types, with new graphics and new stats, and the patch comes with a variety of vehicle sets that redefine the Transport Tycoon experience. You can play with new ships, new trains, new road vehicles, new everything! With a bit of graphical skills and some hex-editing you can even make your own new vehicles! With this feature, the monorail track system is replaced by an electrified railway system with an overhead catenary system. You can choose to have TTDPatch calculate a more realistic acceleration for trains (and road vehicles), taking into tractive effort, friction, air drag, and others for a more realistic motion of trains and road vehicles. Have you noticed how houses can build on the side of mountains and on slopes, and did you ask yourself why you can't build tracks like that too? Well, now you can! You'll be able to build tracks, roads, depots, even stations on uneven ground, with foundations under the tracks to keep them level. Did you ever buy so many vehicles that you couldn't buy more? Normally, TTD has a limit of 690 individual vehicles, in up to 80 trains, 80 road vehicles, 50 ships and 40 planes. With TTDPatch, these limits are now much higher: up to 240 of each type, and up to 40,000 vehicles including wagons! That should be enough for any tycoon... .
Have you ever been annoyed by the fact that some of the train engines come with a capacity for passengers or mail? That you can't use the "Full Load" switch when they are serving a coal mine? Now you can refit train engines, to carry what you want! (Except mail or oil unfortunately). If you're wondering what happened to the "Reverse Train" button, it is still available if you open the train window while the train is not in a depot. Some of the new road vehicles and ships also have special refitting options with only a limited selection of cargos available for refitting. 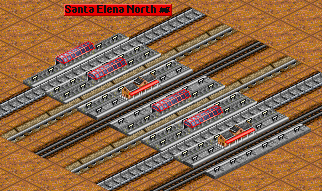 Both get rid of the "Station too spread out" message, and have up to 7 platforms in a single train station, by adding additional platforms once it's built. 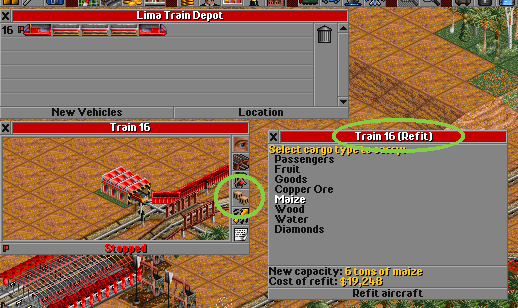 Also notice the use of the "checkpoint" station at the lower left corner, through which all goods trains have been scheduled to go. That way it can't happen that all platforms are blocked by goods trains, and no other trains can enter the station to actually unload cargo that would allow goods to be produced! 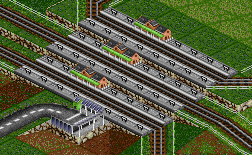 And if you add a platform of a different train type, you can now have mixed stations with railroad, monorail and maglev all in one station. 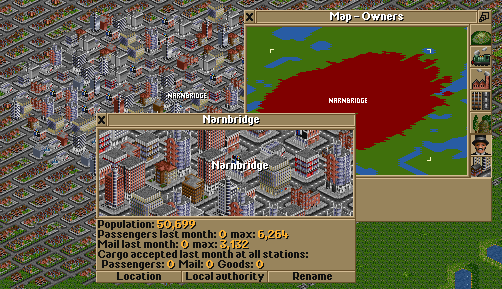 Plus, with the "buildonslopes" feature you can even make multi-level stations! Here's how it works: The two trains will wait until one of the station's platforms becomes available, and not clog up the entrance while they're waiting. 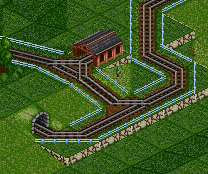 Are you annoyed by having to manually change all your tracks once Monorails and MagLevs become available? No problem anymore, just plant a sign named "Cht: Tracks 1", and all your tracks along with the trains will be converted to monorail. 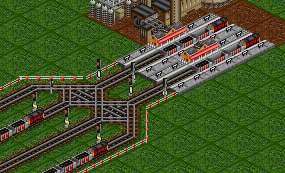 This way you can even have steam engines running on monorail or maglev tracks, like in this picture. You get a choice from more currencies, and in 2002, the Euro is introduced, replacing the national currencies. 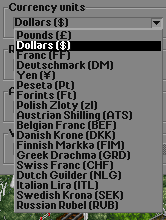 Plus, if your favourite currency isn't on the list, all of the new currencies are fully customisable, and you can change one of them into any currency you want! Now you can buy additional engines for a train, for increased power and speed. This is especially useful in the early game with only very weak engines, but also in mountainous terrain like the arctic and tropical climates, in particular with the realistic acceleration model, where more power really makes a difference. Now you can play forever, the game won't stop. It will keep running forever, and everything will still work. Note that there won't be any new vehicles after 2050 though. You can also use the money cheat, and other cheats that can be a big help! Annoyed by the trains slowing down so much at hills and in curves? Just turn the new mountain and curve handling on and watch that Chimera zoom along your tracks with nothing slowing it down. Do your trains need an explicit route to find the stations? Are you using a lot of waypoints to guide your trains to the right place? 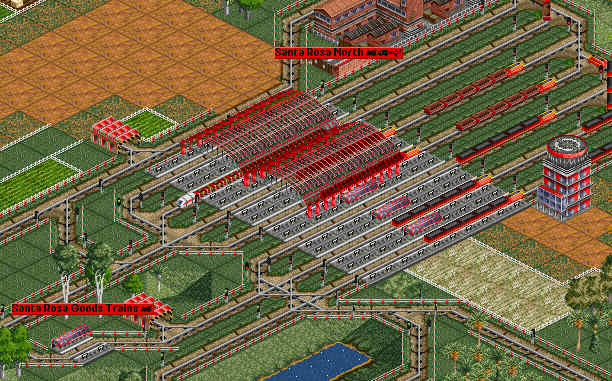 Now they just have to be a single square large, and you can set them to non-stop so that the trains won't even stop at them at all with the new non-stop handling. Now you can remove city roads and bridges, and more industries per town, as well as remove your statues and other objects. Have as many as 126 carriages on your trains. Or completely turn off servicing by setting "Vehicle Breakdowns" to none and changing the default service interval to some 50 years. Now no train will ever again try to find a depot, no problems with messed-up schedules and perpetually searching trains anymore. And now there's no need to include a real airport in a helicopter's schedule, because it doesn't have to be serviced anymore. Please note that everything here is an actual screenshot, and can be achieved by using this patch. Except the highlighting circles, which I obviously added to an actual screenshot.